Having two little girls I know my house is going to most likely house an expansive collection of dolls. Lately, they are Pinky’s favorite thing to play with. She loves playing pretend had making her dolls have conversations with one another and dressing them in different outfits. 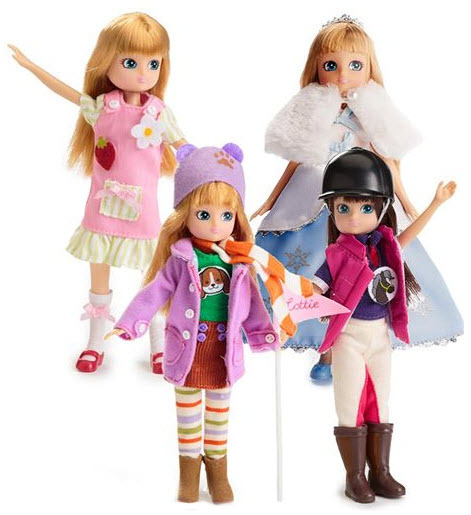 Lottie Dolls are a refreshing addition to our doll collection. I was recently asked to review one and have been nothing but pleasantly surprised. What makes Lottie Dolls so special is that first off, they aren’t overdone or unrealistically proportioned (if ya know what I mean). Lottie Dolls also embody the strength of women. Butterfly Protector Lottie may inspire a love for nature, experiments and science. For a strong mind and strong body, girls will find intrigue with Kawaii Karate Lottie. Unconventional career paths can be found in Pirate Queen Lottie, not a current career track but a path that shows that women can do anything men can do! Right matey? And Robot Girl Lottie is a whiz at the science fair. An interest in robotics could happen by playing with this adorable toy! She’s adorable and comes dressed in a perfect little pirate uniform! We also chose a fancier sparkly blue velvet outfit set that she looks super cute and stylish in. I’m loving the Lottie dolls, they aren’t overdone with makeup and are just plain sweet. Also note that, Lottie dolls can bend their arms and legs but the knees and elbows do not bend. For all the latest news and updates about Lottie dolls visit the Lottie website and follow them on Facebook, Twitter and Pinterest. WIN IT! One Mommy Digger reader will win a Lottie Doll and an additional outfit of their choice! To enter, fill out the form below. I received a Lottie Doll and outfit to facilitate this review. All thoughts and opinions are my own. I really like the Spring Celebration Ballet Lottie! My niece is in ballet and she loves anything ballet, she would love to be able to play with this! I love the Butterfly Protector as my daughter loves butterflies. I like the Butterfly Protector doll.